from mid-19th-century Shaker music to jazz, folk and classically inspired works by leading 21st-century choral composers. The Santa Fe Desert Chorale’s commitment to expanding the choral canon led to the commission of Jake Runestad’s Reflections. 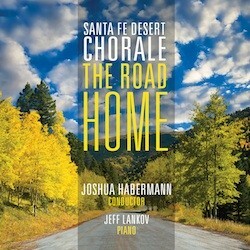 The 24-voice, professional Santa Fe Desert Chorale, one of the most distinguished American vocal ensembles, makes its commercial recording debut with beautiful and assured performances, led by artistic director Joshua Habermann.